Digestion is the breakdown of food into its individual nutrients and absorption is the process by which those nutrients travel from the small intestines into the bloodstream. Most of the lipids we consume are in the form of triglycerides. Triglycerides consist of three fatty acids attached to a glycerol backbone as shown in the image to the right. Triglycerides are the “fat” we eat and about 90-95% is absorbed. Triglycerides are also called triacylglycerols (TAGs). We also consume sterols, mostly as cholesterol, and to a small extent phospholipids. About 50% of the cholesterol we consume is absorbed. Very little lipid digestion take place in the mouth. In the stomach, triglycerides start to be broken apart mechanically and by an enzyme called gastric lipase. 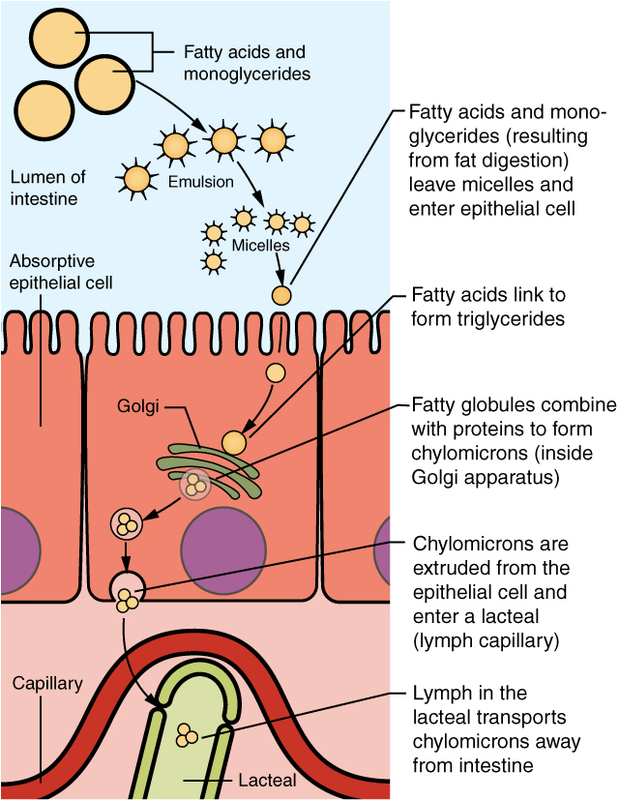 When lipids reach the small intestines, bile is released and creates neat packages that allow lipids to be suspended in the watery environment of the intestines (more below). An enzyme called pancreatic lipase is released from the pancreas. Lipase further breaks down triglycerides to monoglycerides and two free fatty acids. A monoglyceride is a single fatty acid attached to the glycerol backbone. Monoglycerides are also called monoacylglycerols (MAGs). In the image to the right, note that the central fatty acid is attached to the glycerol backbone and the two remaining fatty acids are free. A similar process takes place for phospholipids. A phospholipase enzyme breaks down the phospholipid releasing free fatty acids. Most cholesterol (~85%) consumed is in a free form, requiring no further digestion. Bile is made in the liver and stored in the gallbladder. When lipids enter the small intestines, this triggers the release of bile. Take a look at the image to the right. A bile acid has two sides, a hydrophilic side and a hydrophobic side. Hydro means water and phobic is a strong fear. Hydrophobic essentially means fear of water. In the image, the yellow side on the left is the hydrophobic side. The right side with the green dots is the hydrophilic side, and hydrophillic means water loving. To allow lipids to travel in a watery environment, the hydrophobic side binds to the lipid and surrounds it. The hydrophillic side, the water loving side, is now exposed to the watery environment. The lipid can now easily travel in an aqueous environment. To better understand how bile acts as an emulsifier and allows lipids to travel in an aqueous environment, think about creating a salad dressing of vinegar and oil. What does it look like? In the image to the right you can see yellow fat droplets, in blue water in the upper left corner. When we initially pour oil into water, we might see some fat droplets, but they eventually combine and the fat floats to the top. This is what would happen in your intestines if bile was not present. In the lower image, you can see bile surrounding the fat droplets. With its water-loving exterior, it allows fat to be dispersed throughout the fluid environment. Bile aids the digestive process by making it easier for enzymes to digest the fat, but is necessary for lipid absorption. After bile is absorbed and utilized, it can be recycled by the body and reused. Short chain fatty acids, glycerol and some longer chain polyunsaturated fatty acids do not require bile for uptake into the intestinal cell and transport in the bloodstream to the liver. Saturated fats are hydrophobic and therefore they require bile for transport. Polyunsaturated fatty acids, due to their structure, are less hydrophobic and therefore better able to combine with water and be absorbed unassisted. Longer chain fatty acids, saturated and monounsaturated fatty acids, fat soluble vitamins and cholesterol require bile for absorption. Once fatty acids are brought into the intestinal cell, they are bound to glycerol to form triglycerides. Then, they are packaged into chylomicrons with proteins, other lipids and fat soluble vitamins are released into the lymphatic system. Chylomicrons are too large to enter directly into the capillaries, so they travel in the lymphatic system until they eventually make it into the bloodstream. Triglyceride image modified, by Wolfgang Schaefer on Wikipedia, CC0 1.0. Bile salt image by Frank Boumphrey, MD, on Wikipedia, CC BY-SA 3.0. Fat droplets in water and the role of bile image created by Christine Dobrowolski, CC BY-NC-SA 2.0.